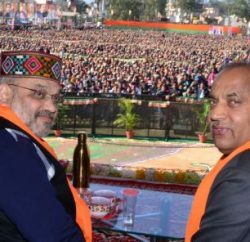 Chamba: Senior BJP leader and party candidate of Kangra parliamentary Shanta Kumar formally started his election campaign from Chamba. Shanta Kumar promised to set up proposed cement plant at Sikridhar in Chamba district. He said that the cement plant would create employment in the region. He said that plant would be his top priority. He also promised to give emphasis on the tourism industry in Kangra and Chamba. BJP candidate reminded that he had launched Antodaya Yojna in 1977 from Chamba town itself and later in 2000 he had launched Antodaya Anna Yojna from the town. He said that Antodaya Yojna is still relevant and promised to implement in a big way if voted into power. 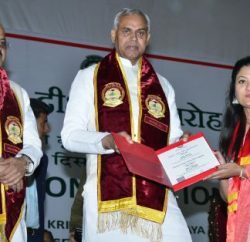 Shanta Kumar stated that Narender Modi led NDA alliance will form the government in the centre. He accused Congress for promoting and sheltering corruption and many big scams in its regime were the witness. He hoped that Congress will face its biggest defeat in the history of Indian polity. 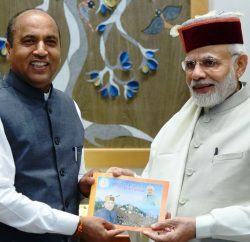 He also targeted Chief Minister Virbhadra Singh over corruption allegations and advised him to resign from the post.